Yoga, along with pilates, is my favorite form of exercise. I love it because you can do it anywhere and it does not require a lot of expensive equipment. It does require a mat, at least if you want to be comfortable while holding all those poses. It is easy to find a mat that comes with a strap that you can sling over your shoulder or use as a carrying handle, but this isn’t always practical. The same goes for the small yoga mat bags that are just large enough for a tightly rolled mat and nothing else. Does it get the job done? Yes. Is there something that can do it better? Yes. I travel a lot and and spend a lot of time biking and walking city blocks with my mat, which is why I went in search of a better tote option. I found something perfect and I can’t wait to tell you about it. Or, you can read the full product details right now at Amazon. Why Do You Need This Backpack? I can’t say enough good things about this bag. Since it is a sling bag style, it is easy to slip on before or after you go to class and just go on about your day. This is perfect for those days when I need my hands free for riding my bike or to chow down on some fresh fruits (my fave after-workout snack is blueberries!). Do you travel with your workout gear? If so, you will love how easy it is to do that with this bag. I have taken all my gear on planes, on hikes and road trips. On a side note, I suggest that you get some anti-bacterial wipes for your mat (if you don’t already use them) to clean it up after you use it on a strange floor or surface. If you want to see some larger images, read reviews or get the full list of features, just click here. You can also see the current price when you get to the details page. If you’re trying to decide if this bag is a good fit for your lifestyle, it might help to check out some of its features. – It has two main large compartments. – There is space for a 15.4-inch laptop computer (if you need to carry one). – Carry a water bottle to your class? There is a side holder for that. – Do hot yoga and end up with wet towels or clothes? You will totally love the lined pocket that is made just for your wet items. – Built-in cell phone pocket and a small zippered pouch for your keys, money, etc. I love that the design of the bag helps balance out the load. And, since the mat is carried on the outside, you can easily use this as just a sling bag when you are not going to a fitness class. You really can’t go wrong with this bag for your Pilates class or other work out and fitness needs. First, this is a great gift for yoga lovers since it is so practical. But, you can also buy it for yourself. If you do all of your working out at home, or drive right to the front door of the place where you take your class, then you likely will not need this bag. However, if you walk to a gym, studio or class or end up walking around with your mat after class, then this is a good choice for you. You can also use this pack if you end up taking the mat with you when you travel away from home. It is really the easiest way to transport your fitness gear – assuming that you need to carry things other than your mat. Otherwise, you will need a separate bag in addition to that teensy bag. There are duffels and other bags out there if you need super-sized space, but for the money – this one is the best value yoga mat backpack. And it really does have a decent amount of space. Are you using the backpack listed up above? Or are you using a different type of bag to carry around your mat? Why not leave a comment to let me know what you’re using and how it is working out for you. Feel free to give any tips that you might like to share as well. Yoga backpack if selected carefully can surely be of great help to oneself. 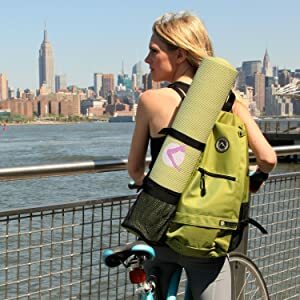 This yoga mat bags dont only helps us in protecting our expensive yoga mat but also makes it easy for us to carry the same from one place to another. I would like to thank you for sharing such a wonderful and indepth article on selecting best yoga mat bags.